Hillod the Outlaw is a wanted Redguard thief who is using the Abandoned Shack in the Imperial City's Waterfront District as a hideout. Because of a run-in with the law, he had to flee Solstheim, where he was employed in construction at the Raven Rock colony. He is also a Pickpocket of the Thieves Guild. He shares the shack with another ex-employee from Raven Rock, Dranas Llethro, but that is seemingly all they have in common. While Dranas is out hunting jobs all day, Hillod spends his time walking around the district, doing nothing but daydreaming about starting a new life in the Imperial Reserve. He always starts the day at 6am with a two-hour breakfast inside the shack followed by an hour of wandering. He heads outside at 9am and spends the next seven hours strolling around the district, preferably on the nearby beach, on the dockside or near the shack. At 4pm, he goes back inside and enjoys an early dinner. He goes outside once again at 6pm and strolls around for another hour before he finally crosses the causeway and leaves the district through the northern gate at 7pm. His destination is the fashionable Elven Gardens District, where he will spend four hours wandering around while chatting with the district residents. At 11pm, he returns to the shack, where he stays awake all night long until it is time for his breakfast at 6am. The exception to this routine is during the Misdirection quest, when all Waterfront District residents are confined to their homes. He wields an iron shortsword and wears a set of common lower-class attire, a pair of fishing waders and oiled linen shoes. He carries around a spare pair of blacksmith's pants and a small amount of gold. When you meet him for the first time, he will be surprisingly honest about his situation, bluntly stating, "You can call me Hillod the Outlaw. Because I'm on the lam." And when asked about his city of choice, he will share his future plans by saying, "I helped build Raven Rock. Had a bad run-in with the law, so here I am. Pretty soon I'll head out for the Imperial Reserve, try my luck there." During the Untaxing the Poor quest, the Waterfront Tax Records noted that he was "empty handed - thrashed". Hillod never sleeps due to him not having a sleep package. 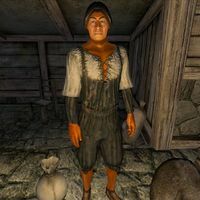 This bug is fixed by version 3.2.5 of the Unofficial Oblivion Patch. This page was last modified on 17 August 2018, at 04:47.